NEX Transport took home United Way’s biggest honor, the coveted Traveling Trophy in the Large Business Division (for workplaces of 100 or more employees). NEX increased giving by six figures, pledging exactly $207,000 after surpassing $102,822 last year. More than 900 associates combined to give $140,000, while corporate support and event sponsorship totalled $67,000. 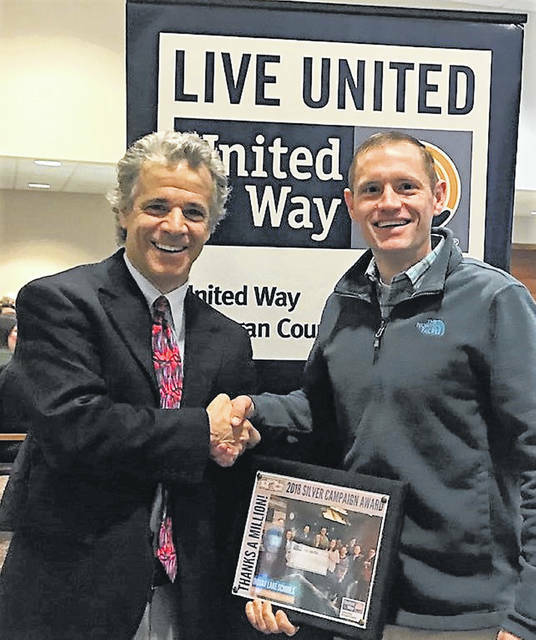 Indian Lake Schools Superintendent Rob Underwood accepts a Silver Campaign Award from United Way volunteer Lou Vito for the district’s philanthropic efforts with United Way. Teachers and staff combined to raise $9,233 for the 2018 campaign. On a day when frigid temperatures showed local thermometers reading below zero, a thermometer of a different kind rose higher than ever. 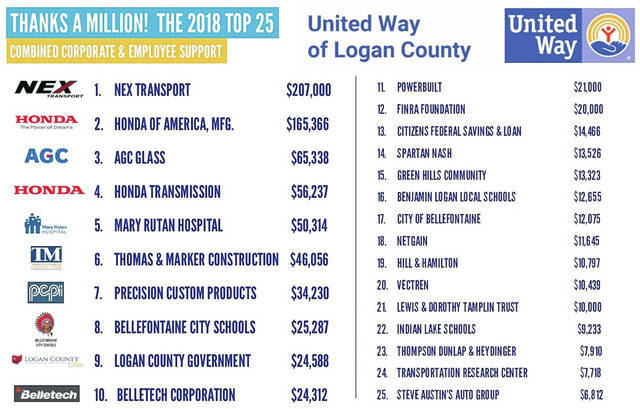 United Way of Logan County reports $1,038,555 was pledged to the local nonprofit during its 2018 fall campaign, marking a 9.1 percent increase over last year. It’s the fifth straight year the organization has surpassed its fundraising goal. United Way of Logan County made the announcement at its 2018 Campaign Awards Breakfast on Jan. 30 at Green Hills Community in West Liberty, where corporate and individual donors who pledged so generously, and the Million Dollar Roundtable volunteers who helped raise the money, were recognized. Past United Way Directors Ilene Heaton (1988 to 2012) and Heidi Reser (2014 to 2015) returned to join the celebration and assist in recognizing the volunteers. For the second year in a row, NEX Transport increased giving by six figures, pledging exactly $207,000 after surpassing $102,822 last year. More than 900 associates combined to give $140,000, while corporate support and event sponsorship totalled $67,000. The achievement rewarded them with United Way’s coveted Traveling Trophy in the Large Business Division (more than 100 employees). AcuSport had earned this award every year of the award’s existence. 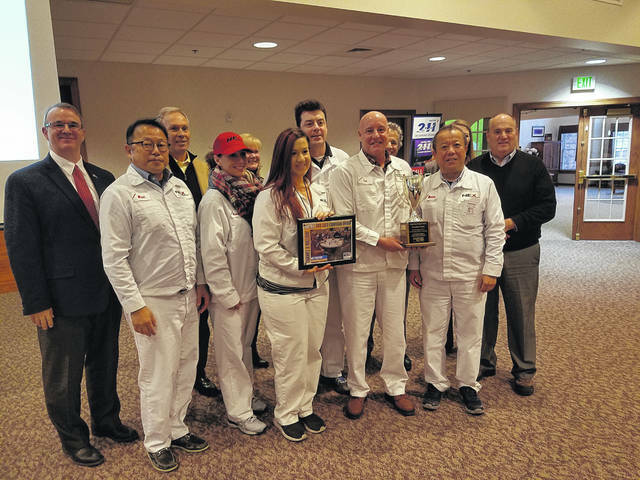 For the second year in a row, Vectren took home the Traveling Trophy for Small Businesses with an incredible per capita gift of $1,739 among their six Bellefontaine location employees. With the money, United Way fights for the education, health, and financial stability of every person in Logan County. 45 programs of 30 Funded Agencies are being supported in 2018 by United Way allocations. An additional, $85,000 has been made available for use throughout the year for additional organizations to access through United Way’s Community Impact and Youth Allocations Grant Funds. The following workplaces earned Gold Campaign Awards, achieving at least 60 percent employee participation, a $200 or higher average employee gift, or a 100 percent corporate match: AGC Glass, Bellefontaine City Schools, Belletech Corporation, Citizens Federal Savings & Loan, City of Bellefontaine, Civista Bank, Hill & Hamilton, Humble Construction, Liberty National Bank, Logan County Auditor, Logan County Board of Developmental Disabilities, Logan County Commissioners’ Office, Logan County Department of Job & Family Services, Logan County Electric Cooperative, Logan County Family Court, Lutheran Community Services, NetGain, NEX Transport, PowerBuilt, Precision Custom Products, Smith Smith Montgomery & Chamberlain, Steve Austin’s Auto Group, Thomas & Marker Construction, Thompson Dunlap & Heydinger, Vectren, V-Teck Communications, and Zimmerman Realty. The following workplaces earned Good Neighbor Awards, given to select entities that participate with United Way but do not qualify for a Campaign Award: Lewis & Dorothy Tamplin Trust, Logan Acres, Logan County Chamber of Commerce, Logan County Sheriff’s Office, Quest Federal Credit Union, Shine FM, Transportation Research Center, and United Tool & Machine. United Way’s local Campaign totals have increased seven straight years from 2012 to 2018 for a 67% increase in annual giving. Dave Bezusko is Executive Director of United Way of Logan County.